Looks like F1 championship for the ps3, though it could be rFactor but the graphics look too good for that. rFactor with BMW 08 from rFactor Central as a base but their physics of the car and engine will be more accurate. LFS is the king physics wise. 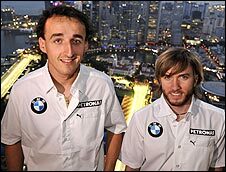 Well the William's drivers have been retained for next year, and Flavio has said Di Grassi is ready for F1, so bye bye Piquet i thinks. Which is a shame, i would of liked to see him do well, for his fathers sake. He has a seven point lead, and two of the races are very likely to be wet, one nearly definitely tbh. He lost it by more last year, but none of the errors were even down to Lewis, and he's hardly likely to make the same mistake twice. Yay, my support for BMW will continue with them keeping on Nick, i love that guy, he looks like a rock star with his beard. Check out the photos of the two on the BEEB website. It looks like they have one driver that is a big fat ugly giant, and the other looks like a bearded wise leprichan, that has found a pot of gold!